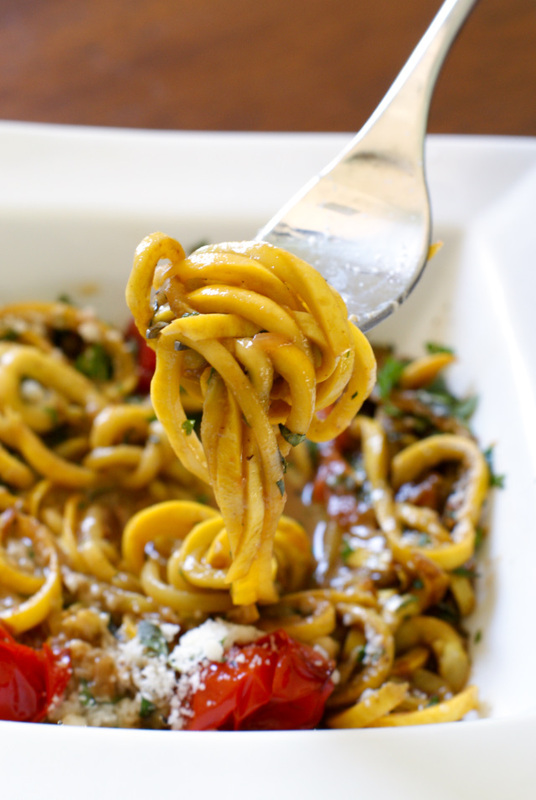 Summer Squash Pasta with Tomatoes and Herbs is a light and healthy dish that is quick and easy to make featuring yellow squash noodles, tomatoes, garlic, fresh herbs, and pecorino romano cheese. I recently splurged on a spiralizer attachment for my Kitchenaid. I had been shopping around for a spiralizer for some time, and then it dawned on me that I could simply buy the attachment piece instead! I wanted the spiralizer so that I could make one thing -- veggie noodles! Zucchini noodles, also known as zoodles, have become all the rage lately and foodies everywhere have become spiralizing fools. I jumping on that bandwagon of fools, y'all. After seeing zoodle recipes practically everywhere, I naturally had to get in on the action. Got to keep up with the trends, right? 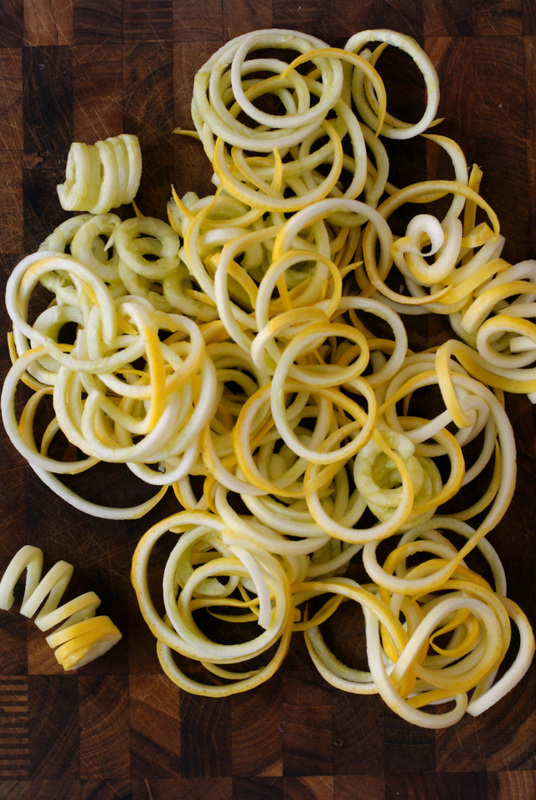 While zoodles made from zucchini are delish, I've become quite fond of using yellow squash for my veggie noodles. Once I give them the spiralizer treatment they are pretty little curly cues of deliciousness! Once they're cooked, the yellow squash noodles look similar to real pasta! Not that it matters, but if I'm going to call it pasta, my brain tells me it should look like pasta in shape and color, so yellow squash is perfect. This recipe pairs the squash with grape tomatoes, garlic, and fresh herbs...a perfect summertime combination! When cooked just right (see notes below), the squash releases just the right amount of its natural juices which, when paired with a splash of balsamic vinegar and some grated cheese, makes a light and flavorful sauce for the noodles. In a skillet, heat the oil over high heat. Add the tomatoes to the pan and cook for 2 minutes without stirring. Stir them around and continue cooking for another 2 minutes, stirring often. Reduce the heat to medium and add the onions to the pan. Cook for several more minutes until the onions begin to soften. Add the garlic to the pan and continue cooking, stirring often for 1 more minute. Toss with 1 Tbsp of the pecorino romano cheese and the fresh herbs. Top with the remaining cheese and serve immediately. It's important not to overcook your squash. I have experimented with leaving the noodles cooking for a bit longer and they just turn to mush, get very watery, and aren't pasta like at all. You want to take them off of the heat just as they begin to soften and begin to release their natural juices. They should be al dente and a little firm, but soft and pliable like noodles. This looks very yummy! I notice that your "zoodles" are quite thick. What brand of spiralizer do you use? All that I have ever seen only cut the strips about 1/16" thick even at the different widths. I use the spiralizer attachment on my KitchenAid stand mixer.